If there was ever a player that left Chicago for Winnipeg that would be considered The Prodigal Son, it would be Bobby Hull. In 2009-10, Ladd was a 23-year-old winger coming of a regular season that wasn’t trending in the right direction. 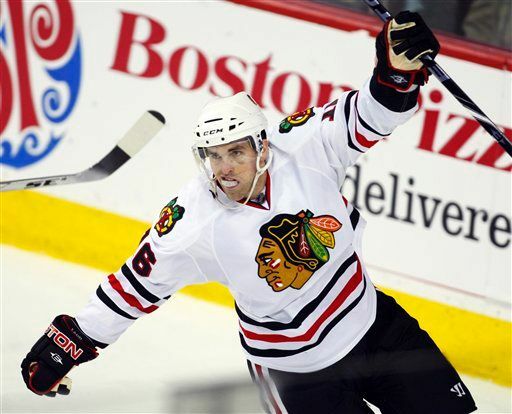 After a career-best 49 points in 2008-09, his first full season in Chicago, Ladd took a step back to 38 points while more than doubling his penalty minutes from 28 in 2008-09 to 67 the following year. But during that postseason, Ladd was a key part of the Hawks’ run to the Stanley Cup. Playing through injuries, he scored three goals and added three assists in 19 playoff appearances. He was big, young, fast and his name now appeared twice on the Cup. Certainly the Hawks would hang on to him… right? When free agency began, and the Blackhawks started assessing how much their core players were going to cost. Ladd was a restricted free agent who had posted 33 goals in the previous two seasons. Based on his two rings and leadership, he was in line to get a nice raise from either the organization or a third party arbitrator. The Hawks decided they couldn’t afford whatever his new salary would be, and pulled the trigger. Ladd was the last man dealt out of town. On July 1, Ladd was traded to then-Atlanta for defenseman Ivan Vishnevskiy and a 2012 second round pick. The trade of Ladd came before Niklas Hjalmarsson signed his offer sheet, and before Antti Niemi’s arbitration award was too much for the Hawks. Neither of those events had much/any impact on the Ladd trade. At the time of the trade, the Blackhawks didn’t know what they had in then-college-freshman Nick Leddy. They also hadn’t shown (and still haven’t shown) any confidence that AHL All-Star Brian Connelly would ever see the NHL. Vishnevskiy was young, had some NHL experience, and was a puck-moving defenseman. He was brought in to fill a perceived need. Ladd was given a one-year deal by Atlanta worth $2.35M last year, and was named the captain of the Thrashers. He established career highs with 29 goals and 59 points; Ladd was given increased opportunity in Atlanta, and took advantage. He became the player many had expected he could become one day. 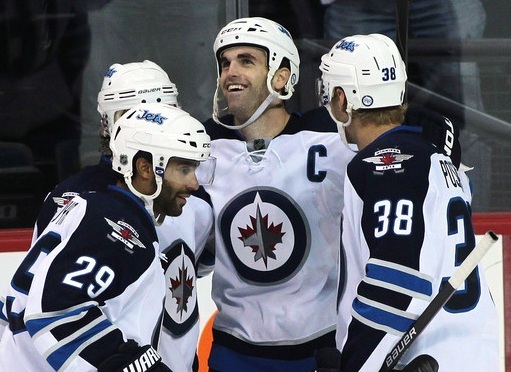 Now, Ladd is the 25-year-old captain of the Winnipeg Jets. He is playing in the first year of a five-year, $22M contract and hopes to get Winnipeg into the playoffs in the next couple years. From Chicago’s perspective, the trade is still grading as incomplete. Vishnevskiy has been surpassed by a number of defensemen in the organization, and he has since left Rockford for Russia. He had no impact on the organization. The second round pick that was acquired in the deal became the 36th overall pick in the 2011 Draft, which GM Stan Bowman used on defenseman Adam Clendening. He’s a good, young defenseman that could factor into the future of the blue line in Chicago. Right now, however, Chicago fans look at a 6’3, 205-pound forward that can fly up and down the ice and put up 60 points as the greatest casualty of the salary cap cutting that had to be done during the post-Cup summer of 2010. Ladd was a fantastic role player for the Blackhawks, and has been even better in Winnipeg. I totally agree. Ladd was by far the hardest one to see traded away. He has a lot of the intangibles that were sorely missed last season. I don’t think he’s nearing his peak as a point producer, and has shown leadership qualities. He’s also battle-tested in the biggest games a player can compete in. I wish him all the best. He should have been a long-time Blackhawk. While most were crying over the loss of Byfuglien I just kept saying that Ladd was the biggest loss. Ladd is not great at one thing, but good at everything. He can score, hit, kill penalties, and be a leader. Most importantly he has won twice in his young career. Ladd definitely is the one who got away and in hindsight is definitely the worst of the cap clearing deals. However, I think it is important to note that he was the last of the deals (Barker sent off mid-season, Versteeg and Buff were in the week leading up to the draft). Typically, sell offs happen pre-draft for picks, so the fact that Ladd was traded post-draft is not insignificant. Also, Stan knew he could only pay either Ladd or Hammer (and hoped he had enough $ left over for Niemi). Show me how they would have been able to keep both Ladd and Hammer even without the offer sheet? It would have been impossible, they couldn’t even fit Marty Reasoner’s salary!!! And finally, like Buff, the Hawks were also considering the inability to retain Ladd beyond the 2010-2011 season. He had a great year, and got paid for it. Even without Campbell’s contract (which a year ago Stan didn’t even dream of having the ability to get rid of), we couldn’t fit his $4.4M under the cap for the 2011-2012 season. 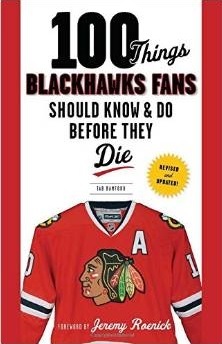 You can fault the Hawks for not picking the right guy to keep, but you can’t dispute the fact that they could not keep more than one of Hammer, Buff, Versteeg, and Ladd. And frankly, given the lack of organizational depth beyond the top 3 D a year ago, I really can’t blame them for keeping Hammer over Ladd (especially while retaining the then emerging Brouwer). Wow. While I agree Ladd is a gigantic loss, and one of the worst we’ve had to endure as an extremely loyal fans of our teams, I have to disagree with everyone on this. Byfuglien was the biggest loss. And the second biggest loss was Niemi. Arguments could be made for either of them being MVP during the Cup run. Big Byf notched 11 goals (tied team lead) and 6 PP goals (tied team lead), and had 5 game-winning goals in the playoffs. Not only that, but he played the Rodman role all season – and especially well in the playoffs – by taking out the opponents’ best big guy in each series. Imagine that, a Rodman who can score and WIN games, and plays his best hockey when it counts. How is he not the biggest guy to get away? He was the biggest impact player on the team that won it all. One of the worst feeling I’ve ever had as a fan came when he was gone. Niemi backstopped us to the f’ing Cup. The Hawks should have paid him. They saved 1.25M and got Turco. Crawford has stepped up and been amazing, but with all due respect to him, Niemi should’ve been signed for a long-term deal. He had up and down games through the playoffs, as every goalie does, but was amazing at times. He kept us in so many games long enough for our guys to win them. Ladd was a major loss. He was not a great PKer, but was good with the man advantage. I would best describe it as this. We essentially gave up on Ladd (due to the Hammer deal) and Brower being in Chicago and under contractual control. Ladd and Brower are similar type players, but Ladd is just better. It is unfortunate we couldn’t retain him. I am torn on the Niemi deal. We didn’t know what we had with Crawford and Crawford was excellent in the VAN series last year. He was the best goalie on the ice throughout that series. However, where I think Crawford is consistently better than Niemi I saw Niemi’s great streaks. When Niemi was on, he was better than Crawford’s best. Niemi won us games in ’09, Crawford played great in ’10 and we still lost meaning he couldn’t win us a game by himself. The biggest problem with losing Ladd, and why he was the hardest one to see go was…the Blackhawks still cannot find a decent #2 center. Ladd would play on the Kane/Hossa line and we wouldn’t have to continue year #2 of that search. Ladd was a significant loss; he would be a strong contributor in so many facets of the game now. In hindsight, it was OK to lose Buff and Versteeg as I don’t think they had the overall discipline either on or off the ice and that proved to be one of the catalysts for their eventual departure; that and salary considerations. If Ladd stays on the roster, Hawks go deep in the playoffs last year. The absolute toughest loss of the salary cap. One of the best highlights from the 2010 regular season was when he KO’ed Kessler.